Homebuyer demand remained strong in May, with properties selling faster than they did one year ago in every Northern California region in which Pacific Union operates except for Sonoma Valley. Homes sold in less than three weeks in the East Bay, Contra Costa County, Silicon Valley, and the Mid-Peninsula. 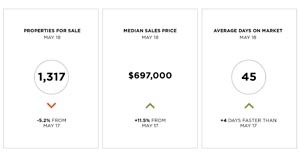 Click on the image accompanying each of our regions below for an expanded look at local real estate activity in May. The median sales price in Contra Costa County was $1,324,000 in May, down slightly from April but up 8.1 percent year over year. Homes sold in an average of 19 days, identical to the pace of sales recorded in May 2017. Click the image to the right to see these and other Contra Costa County market statistics for May. The East Bay‘s median sales price ended May at $1,200,000, a year-over-year gain of 4.1 percent. Homes here continued to command the largest premiums in the Bay Area, an average of 119 percent of original price. Click the image to the right to see these and other East Bay market statistics for May. Defining the East Bay:Our real estate markets in the East Bay region include Oakland ZIP codes 94602, 94609, 94610, 94611, 94618, 94619, and 94705; Alameda; Albany; Berkeley; El Cerrito; Kensington; and Piedmont. Sales data in the adjoining chart includes single-family homes in these communities. The median sales price in Marin County climbed to $1,450,000 in May, a one-year high. Homes sold in an average of 31 days, six days faster than at the same time last year. Click the image to the right to see these and other Marin County market statistics for May. Defining Marin County:Our real estate markets in Marin County include the cities of Belvedere, Corte Madera, Fairfax, Greenbrae, Kentfield, Larkspur, Mill Valley, Novato, Ross, San Anselmo, San Rafael, Sausalito, and Tiburon. Sales data in the adjoining chart includes single-family homes in these communities. Homes in Napa County sold in an average of 57 days, the quickest pace of sales observed over the past year. The median sales price ended the month at $702,500, an annual gain of 4.1 percent. 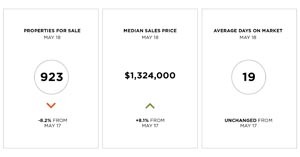 Click the image to the right to see these and other Napa County market statistics for May. Defining Napa County:Our real estate markets in Napa County include the cities of American Canyon, Angwin, Calistoga, Napa, Oakville, Rutherford, St. Helena, and Yountville. Sales data in the adjoining chart includes all single-family homes in Napa County. Although the median sales price for a single-family home in San Francisco decelerated for the third straight month in May to $1,625,000, it was up by more than 10 percent year over year. There were 546 homes on the market, 16.4 percent fewer than there were last May. Click the image to the right to see these and other San Francisco single-family home market statistics for May. As with single-family homes, San Francisco’s condominium inventory declined by double-digit percentage points year over year in May, with 657 units on the market. The median sales price ended the month at $1,280,000, an annual gain of 7.9 percent. Click the image to the right to see these and other San Francisco condominium market statistics for May. Defining San Francisco: Sales data in the adjoining chart includes condominiums in San Francisco County. At $3,300,000, the median sales price in Silicon Valley topped $3 million for the ninth straight month in May. Buyers paid an average of $1,409 per square foot, more than anywhere else in the Bay Area. Click the image to the right to see these and other Silicon Valley market statistics for May. Defining Silicon Valley:Our real estate markets in Silicon Valley include the cities and towns of Atherton, Los Altos (excluding county area), Los Altos Hills, Menlo Park (excluding east of U.S. 101), Palo Alto, Portola Valley, and Woodside. Sales data in the adjoining chart includes all single-family homes in these communities. Buyers snapped up Mid-Peninsula homes in an average of 13 days in May, making it the Bay Area’s fastest-paced housing market. The median sales price was $2,165,000, down from April but up 16.1 percent year over year. 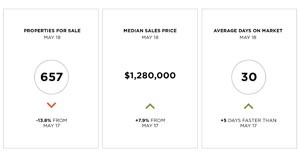 Click the image to the right to see these and other Mid-Peninsula market statistics for May. Defining the Mid-Peninsula:Our real estate markets in the Mid-Peninsula subregion include the cities of Burlingame (excluding Ingold Millsdale Industrial Center), Hillsborough, and San Mateo (excluding the North Shoreview/Dore Cavanaugh area). Sales data in the adjoining chart includes all single-family homes in these communities. Sonoma County‘s median sales price was $697,000 in May, marking a one-year high. Homes sold in an average of 45 days, identical to April’s pace of sales. Click the image to the right to see these and other Sonoma County market statistics for May. Defining Sonoma County:Sales data in the adjoining chart includes all single-family homes and farms and ranches in Sonoma County. Sonoma Valley was the only Bay Area region to see the pace of sales slow from May 2017, with homes selling in an average of 64 days. 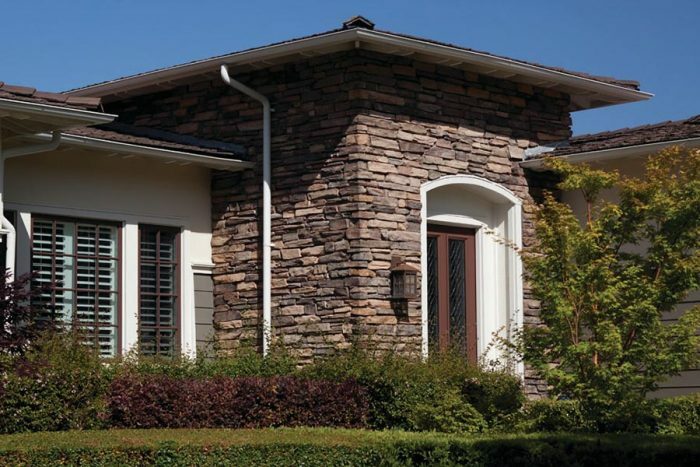 The median sales price climbed to $922,500, for an annual gain of 39.8 percent. Click the image to the right to see these and other Sonoma Valley market statistics for May. Defining Sonoma Valley:Our real estate markets in Sonoma Valley include the cities of Glen Ellen, Kenwood, and Sonoma. Sales data in the adjoining chart refers to all residential properties – including single-family homes, condominiums, and farms and ranches – in these communities. At $776,500, the median sales price for a single-family home in the Lake Tahoe region dropped significantly from April but was still up by 7.5 percent on an annual basis. Buyers paid $553 per square foot, up 22.1 percent from May 2017. Click the image to the right to see these and other Lake Tahoe/Truckee single-family home market statistics for May. Defining Lake Tahoe/Truckee:Our real estate markets in the Lake Tahoe/Truckee region include the communities of Alpine Meadows, Donner Lake, Donner Summit, Lahontan, Martis Valley, North Shore Lake Tahoe, Northstar, Squaw Valley, Tahoe City, Tahoe Donner, Truckee, and the West Shore of Lake Tahoe. Sales data in the adjoining chart includes single-family homes in these communities. Condominiums in the Lake Tahoe region left the market in an average of 49 days in May, the fastest pace of sales recorded over the past year. The median sales price was $424,000 with buyers paying $515 per square foot, 37.3 percent more than they did at the same time last year. Click the image to the right to see these and other Lake Tahoe/Truckee condominium market statistics for May. Defining Lake Tahoe/Truckee:Our real estate markets in the Lake Tahoe/Truckee region include the communities of Alpine Meadows, Donner Lake, Donner Summit, Lahontan, Martis Valley, North Shore Lake Tahoe, Northstar, Squaw Valley, Tahoe City, Tahoe Donner, Truckee, and the West Shore of Lake Tahoe. Sales data in the adjoining chart includes condominiums in these communities.